With its patented new design, the Spot-Spitter DS (DownSpray) creates a unique spray pattern that is perfect for smaller containers. The spray is directed downward toward the soil instead of outward against the container wall with a specially designed deflector plate. This results in a more uniform pattern around the root zone of the plant. Also unique to the Spot-Spitter DS is the patented U-Groove, which reduces the impact of tubing properties on the shape of the spray pattern. The large flow path stands up to dirty water and can be easily cleaned, just remove the supply tube, rinse clean and reinstall. Constructed of UV-inhibited acetal plastic providing years of trouble-free use in the toughest environments. 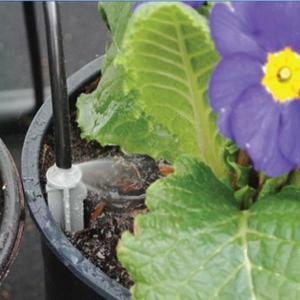 All this, and color-coded flow rates for easy identification, make the Spot-Spitter drippers the simplest, most effective method for irrigating nursery containers.